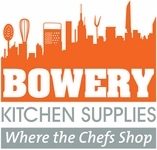 this is Robyn's Favorite model and she shows it to Emeril right in Bowery Kitchen Supplies. It sits right on top of the assorted sized pans for easy use and comes with a scraper. The spatzle he made was delicious!